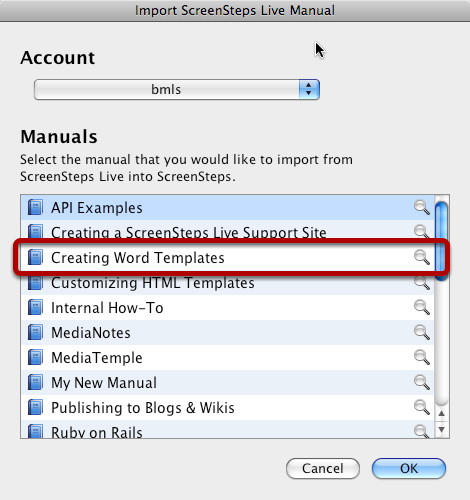 To import the updated manual materials from ScreenSteps Live, open a ScreenSteps Desktop library. If the manual already exists in the library on the desktop then right-click on the manual and select Delete. In this example I am deleting the manual Creating Word Templates. IMPORTANT: If you have any lessons in the manual that have not been uploaded to ScreenSteps Live then you should REMOVE them from the manual before you delete the manual. You can then add the lessons back into the manual after you finish following these steps. In the dialog that appears you can check a box that will delete all manual lessons from the library. Check this box so that you don't end up with duplicate lessons in your library. NOTE: If the manual shares lessons with other lessons in your manual then please contact support and we can help you deal with this situation smoothly. 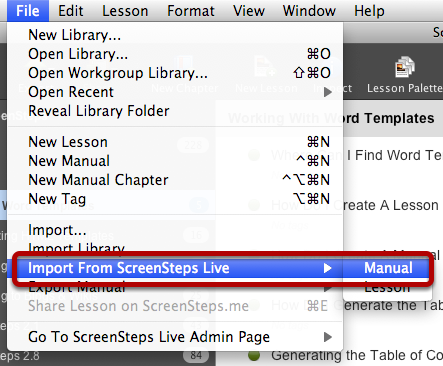 Now you can import the manual from ScreenSteps Live. 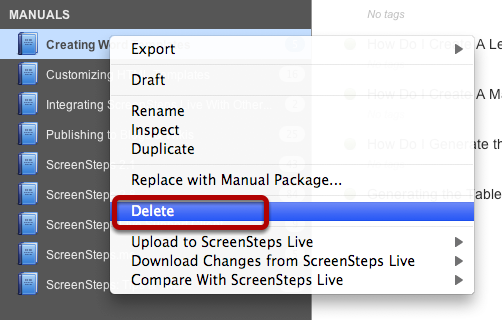 Select File > Import From ScreenSteps Live > Manual. In the dialog that appears select the manual you would like to import. I'm going to import Creating Word Templates. The import dialog will display while the manual is imported. The manual will now appear in your library and the lessons will have the same unique identifiers as the lessons on ScreenSteps Live.